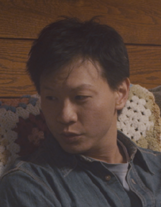 Review: In the Family / It's Just Movies Review: "In the Family"
Patrick Wang has a gentle, honest, remarkably charismatic onscreen presence. What’s remarkable is that besides having the lead role, he produced, directed and wrote this tender legal gripper as well. All this surprisingly artsy involvement is from a Massachusetts Institute of Technology grad. The intelligence shows. Wang plays Joey, a talented renovator and old book restorer. His friend is Cody (Trevor St. John) who loses his wife when his son is still in a crib. He is bereft and Joey, who has lost two sets of families, understands and supports him. After seven months, Cody — a dedicated teacher — goes beyond his heterosexual orientation and is overcome with love for Joey. They join forces to be responsible but very fun dads to precocious, but sweet, Chip (Sebastian Banes). They pander to Chip’s interests. His alarm clock has an airplane motor sound when it goes off. His interest is in dragons so while Cody researches them Joey makes a never-ending set of dragon blocks related to each week of school. Then one day Cody is in an accident and dies. The challenges begin. The first is that in a will written before Joey and Cody became a couple, the house and all financial accounts are bequeathed to Cody’s sister. Not only that, but little Chip is bequeathed to her as well. The sister, as the executor of the estate, feels she must honor Cody’s last wishes. Despite some marketing publicity, this film is not specifically about gay issues. While there is the problematic hospital rule about only relatives allowed, the legalities of not legally adopting a shared child or not updating a will as your life circumstances change apply to all unmarrieds. Wang’s acting and writing are insightful and tender. While no lawyer will touch this child custody case, what is learned from the whole situation is pure genius, relating not just to this conflict but to all. It’s enough to see this film just to learn these three life rules. A primary reason to see “In the Family” is to experience Patrick Wang’s talented mind at work. “In the Family,” a film by Patrick Wang, is available now on DVD and Blu-ray.